Earn more on Forex with FxCash! No deposit required: just trade with your broker, and we'll credit the spread back to you! Register a unique account with FxCash by filling in a simple form. Make sure to provide us with correct and precise details to enjoy our top-tier service. Once you are done, you will get an email with your account credentials (username and password). Activate your broker's trading account in your FxCash personal cabinet section "Trading Accounts". Trade as usual and get rebates for each* Forex trade. You can withdraw your funds any time without restrictions! Trade Forex as you normally do and earn an extra income with no extra investments. Enjoy earning cash on the web with FxCash.net! 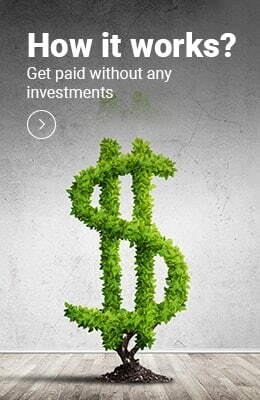 With FxCash, you earn money with no deposit required! Just sign up now and start earning a fraction of your spead from each trade you make, whether successful or not. Win on the Forex market with FxCash!